Whether you’re running a business or are just an individual trying to make ends meet, there is nothing worse than finding yourself in a situation where you have a tax debt, which most likely will also be accruing a general interest charge and perhaps even a shortfall interest charge. The Australian tax system operates under a process of self-assessment, and this applies regardless of the type of tax being assessed, whether that is GST, FBT or income tax. However, even with the guidance available from tax professionals like ourselves, it is not unheard of for taxpayers to still face the prospect of being saddled with a tax debt that’s long after its due date. This can happen due to cash flow difficulties or as the result of personal hardship. Such unfortunate circumstances can prevent affected taxpayers from meeting their obligations on time, causing them to carry a tax debt. Missing a tax deadline will lead to the resulting outstanding debt being subject to the ATO’s general interest charge (GIC). The current rate of interest charged (for the October to December 2016 quarter) is 8.76% (compounding daily). We can seek to have such interest charges remitted in certain circumstances. Let’s be clear. The ATO takes debt collection very seriously because there is substantial revenue at stake. A report last year from the Inspector-General of Taxation on debt collection highlighted that collectable tax debt had grown to more than $20 billion in 2013-14. As the saying goes, ‘prevention is better than cure’. That’s why we offer guidance on good record keeping and managing cash flow, as these are the keys to avoiding a tax debt. Keeping your GST and income tax payments separate from your other finances. Managing your cash flow properly and predicting your monthly income and expenses. Knowing when a debt arises and when it becomes due and payable is key to ensuring that cash flow issues are appropriately managed. To our knowledge, the ATO is at this stage trialling digital tools and apps that can help business taxpayers stay on top of these issues. We are keeping an eye on these developments and will pass on more information as it comes to hand. If you have difficulty meeting your tax debts, then a payment plan may be arranged with the ATO to help you manage the situation. You can apply for payment arrangements online or you may want our professional help. The ATO may take different actions depending on the taxpayer, the type and amount of the debt, although it is generally accepted that the ATO has favoured leniency in granting payment arrangements to struggling taxpayers who have smaller amounts owing. Timely lodgement will also show the ATO that you are aware of your obligations and doing your best to meet them. This can help if you need further ATO assistance. If you subsequently find it impossible to pay an instalment, a good option will be for us to contact the ATO on your behalf when this first becomes apparent. This is an important initiative, as not only can early negotiations lead to a potential variation to your payment plan, but critically, this can preempt the ATO simply ending the payment plan. In the worst case scenario this could mean having to pay the full amount plus interest quite soon, or facing further recovery action. If you owe $25,000 or more to the ATO, obtaining an instalment plan might be a little more difficult. We will need to submit a request to the ATO on your behalf, and provide other information to prove that you can ultimately repay the debt, and have made reasonable efforts to raise the funds. If your tax debt is at the highest level, we advise you to have us contact the ATO immediately to discuss the situation. The ATO will do a detailed assessment and will work with us to set up a payment plan that is manageable and suitable. Sometimes there may be a notice of assessment that appears incorrect in the amount payable – for example, this could be the result of a mistake that you inadvertently made in a past tax return or even a mistake by the ATO. Note however, that this is only available to individual taxpayers, including people operating as sole traders and partners in partnerships. It is not available to companies, trusts or partnerships. If you have a cheaper source of financing (say a mortgage offset facility), the interest rate from accessing funds from such accounts will generally be lower than the penalty rates that the ATO applies via the general interest charge. 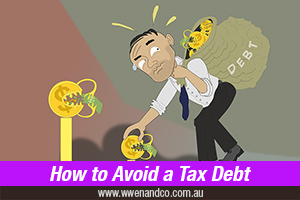 It may be in your best interest to access those funds to settle an ATO debt. For business taxpayers, interest incurred on funds borrowed to repay a tax debt can deductible as a cost of doing business.